Down south, in Bangalore, only a few days after his resurrection, a new book club called A Mixed Bag of Books (MBB) discussed Murugan’s One-Part Woman (translated by Aniruddhan Vasudevan) for their first session. Led by Sanskrit translator Arshia Sattar and writer Samhita Arni, this monthly club is held at local arts venue Shoonya. The next session of MMB will discuss Ursula K. Le Guin’s The Left Hand of Darkness at Shoonya on September 27 at 5 PM. In the meantime, neighboring states Tamil Nadu and Karnataka continue their longstanding dispute over access to Kaveri river water. Following a Supreme Court judgment to increase Tamil Nadu’s daily river water allowance, many regionalist protests have sprouted across both states. This agitation spread to the literary community, too, when on September 11, a Kannada (widely spoken in Karnataka) literature event in Coimbatore, Tamil Nadu, was disrupted and shut down by members of Thanthai Periyar Dravidar Kazhagam, a Dravidian Nationalist (pro-Tamil) group. South of the border, Hubert Martínez, a tlapaneco poet, was awarded Mexico’s highest literary prize for works in indigenous languages last week. Mexico’s cultural minister, Eduardo Vásquez Martín, presented him with the honor at the third annual Festival of Indigenous Cultures, Peoples, and Native Neighborhoods. 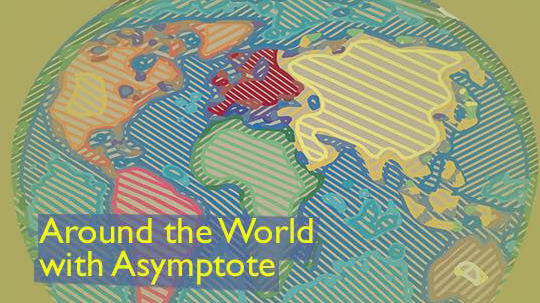 Hopefully we’ll see translations of Martínez’s work in the near future, but in the meantime, check out these translations from Mexican indigenous languages Isthmus Zapotec and Nahuatl featured by Asymptote in the past. As the second anniversary of the Iguala Mass Kidnapping (in which 43 Mexican students were disappeared) approaches on September 26, we also invite you to revisit our “Say Ayotzinapa project”, a special feature in twenty languages accompanied by a preface written especially for the occasion by Valeria Luiselli. In the US, writers are marking the 15th anniversary of the September 11 attacks with poignant essays and remembrances, like Samantha K Smith’s difficult piece this week in Guernica Daily about her father’s experience as a firefighter. And for our world travelers, anyone planning a trip to Los Angeles should be sure to check out Lithub’s literary tour of the city—there’s much more than the celebs and palm trees that meet the eye! If you’re stuck on the east coast, don’t fret, though, because tomorrow kicks off the annual Brooklyn Book Festival, sporting a particularly stellar lineup this year, including Salman Rushdie, Angela Flournoy, Jacqueline Woodson, Hua Hsu, Margo Jefferson, and more. To the north, the Scotiabank Giller Prize for Canadian fiction just announced its 2016 Longlist, and Canada’s Word on the Street festival will host literary events and live readings across the country this September. Get the city-by-city update here. The DADA centennial anniversary was marked last week in Iowa City by a series of events bringing together a band of poets and visual artists flying in straight out of DADAist poet Tristan Tzara’s homecountry, Romania, and a number of writers and researchers in the Iowa Writers’ Workshop, the International Writing Program, as well as the International DADA Archive at The University of Iowa Libraries. The Romanians—Anca Bucur, Ștefan Buzea, Cristina Florentina Budar, Iulia Militaru, Sergiu Nisioi, and Andra Rotaru (or in one word the group frACTalia)—whose project “Manifest(atiOn) pro/con DADA” selected and endorsed by the Romanian Cultural Institute involved an exhibition, a performance, and a round table, ride the crest of a wave of events and publications spanning the past two years in Romania commemorating the traditional avant gardes. The buzz they caused in Iowa City was paralleled by the announcement made in Bucharest of a forthcoming release, a book of “Avant-gardes Marginalia” collecting essays and lectures given by critic Dan Gulea in foremost venues such as the Romanian Academy. 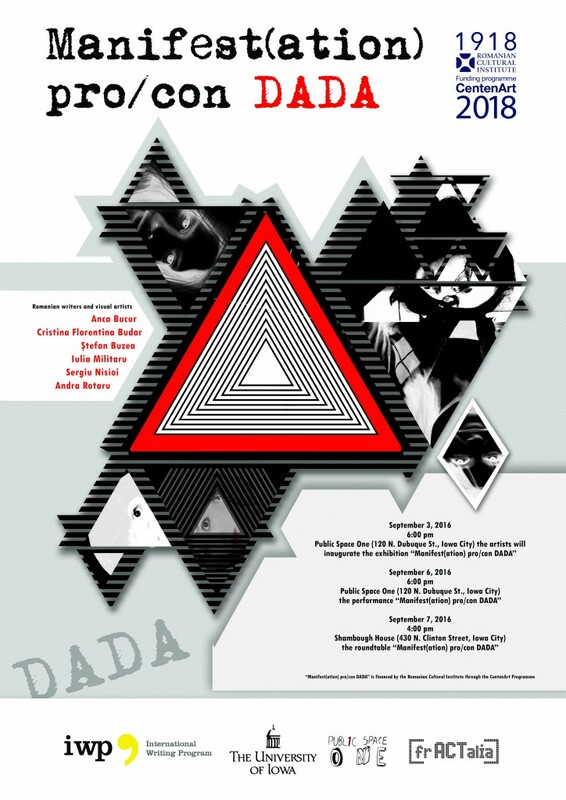 Gulea also mixes literary (critical) discourse with visual—and book cover—art analysis in questioning and disrupting the primacy of “Text” in the literary and cultural criticism of DADAism, surrealism, and other historical and contemporary avant-gardes in Romania and beyond.